What is the age range of the children in each class? All classes are mixed-age & appropriate for children from birth - 5 years old. If it is a Babies only class, children are birth to 6 months at the beginning of the semester. We do not register according to age groupings so the combination of ages will change from one semester to the next. This makes for an especially valuable experience as your child grows! How does the mixed-age format work in class? Early childhood educators are now recommending mixed-age groupings as a better learning environment than traditional linear age groupings. Older children learn from being in a leadership role, & younger children benefit from the example of an older child. Mixed-age classrooms promote social skills and self-esteem. Children of the same age are not necessarily in the same stage of musical development which eliminates expectation. Siblings can participate together, as well as moms, dads, grandparents, & caregivers because the curriculum is designed to teach on many levels of complexity at once. Mixed-age groups foster natural, family-style learning. Are there discounts for families with more than one child? Yes! A second sibling will have a significantly reduced tuition as we provide one set of take home materials per household...also, any accopanying sibling that is still under 10 months of age at the start of the class may attend for FREE! See our Class Fees page for details. If you miss a class you may schedule a Make-Up Class. Three make-up classes are permitted per family/per semester space permitting at all listed locations. To arrange a make-up class please click here to schedule a class at least 24 hours in advance. We often hold free demonstration classes in our currently running classes. Click here for more information or call us directly if a demo class is not listed! How many classes are in each semester? There are 12 weeks of classes in the Fall, 10 in the Winter, 11 in the Spring and usually 7or 8 weeks of classes in the summer. Each semester has a different collection of music. Classes are all a full 45 minutes in length. We allow 15 minutes between classes so that we can maximize the 45 minutes of class time and music making! A maximum of 12 children can be enrolled in each class plus one or two accompanying siblings under 10 months of age. Occasionally there may be an extra family doing a make-up class. One or more parents or caregivers accompany each child or set of siblings. I have a baby under 7 months - do I have to do the Babies Only class? Babies under 7 months are absolutely suited to a mixed- age class as well as the infant class. 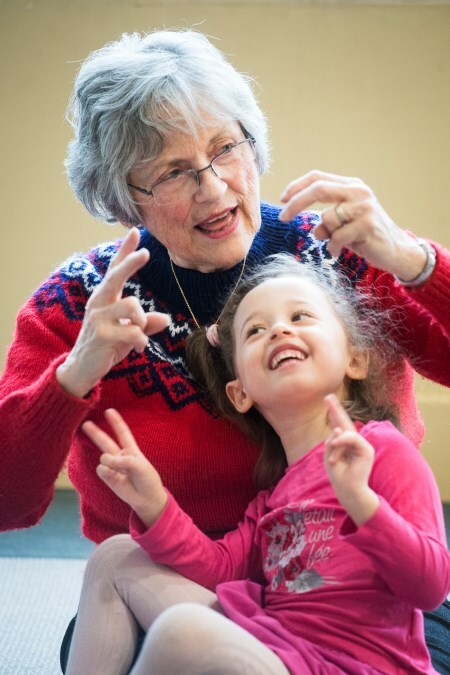 The only difference between the classes is the pace and activity level since a room full of non-mobile infants allows the instructor to structure the class in a more specialized way. The musical content is the same. Babies Only classes are generally geared towards first- time moms who may prefer a slightly calmer environment - it's always best to go with the class day/time that works best for you and your little one. If the Babies class isn't at a good time, find a mixed age one that is and you'll still have a fantastic experience with your baby. During a 45 minute class we will cover 10 – 12 songs, rhythms/rhymes from that semester’s curriculum of 25- 30 songs/chants. Adults and children participate in all activities together with singing and movement being the focus. 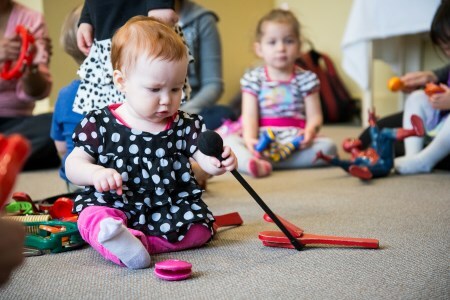 We will use eggs shakers, rhythm sticks, bells, drums or scarves, parachutes, etc during a class in addition to the famous "Play Along" where children and adults will have the opportunity to "Jam" with a wide variety of instruments! What if my child doesn’t want to sit still during the class? We do not expect children to sit still through a 45 minute class at this young age. Children are free to wander about the room - they are still processing importan t musical information in their own way. Parents are encouraged to grant them this freedom (keeping safety in mind always), continue to participate on their own or to take the song or activity over to their child. Music Together classes have a large movement component built in to each class because it's impossible to process music without movement. Can I bring my spouse/aunt/grandma to class? Yes! We welcome adult guests anytime, just please limit the total number of attending adults to three as studio space and instruments are limited. Please do not bring guests to a makeup class. Children who are not registered in the program are not permitted to attend as a guest. No - each lesson plan is carefully developed so that over the semester we will cover all of the 25-30 songs in this semester's collection. In order to explore each song in a different capacity we mix things up every week (some familiar, some new) to keep it fun and interesting! Are the songs the same each Semester? No, there are 9 different collections of material so families can take the course for at least 3 years and not repeat the material. The collections are not sequential so you can begin anytime. A fabulous new CD, beautifully illustrated songbook & digital music files are provided each semester so you can bring the music home! We have a free App so you can take the music with you wherever you go! I’m not musical. Can I help my child develop musical intelligence? Yes, definitely! You are your child’s most important role model no matter what kind of singing voice or dancing feet you have! It is less important how well you sing than it is to make the choice to sing. By your example, children will learn that music is a natural, enjoyable and important part of their lives. You, his/her primary caregiver, are the only one who can give them the gift of a positive disposition for making music. No CD can give him that! Your welcome Educational Guide "Music & Your Child" will also give you more information about how to interact with your child musically to best support their development. Seniors, parents and children, three generations making music together! Please visit the Music Together website at www.musictogether.com for more information about Music Together and articles about the effect of music on child development.